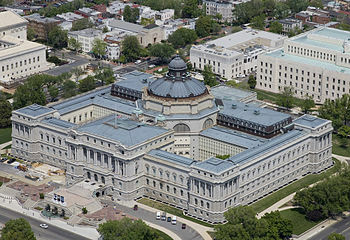 Main Library of Congress Building at the start of the 20th century. The Library of Congress is the de facto national library of the United States and the research arm of the United States Congress. The head of the Library is the Librarian of Congress. James H. Billington is the current Librarian of Congress. He's the 13th Librarian of Congress. Buildings and structures in Washington, D.C. This page was last changed on 10 November 2013, at 16:34.